A hearing loop, also known as an Audio Induction or Audio Loop, provides a magnetic, wireless signal that is picked up by the hearing aid when it is set to ‘T’ (Telecoil) setting. 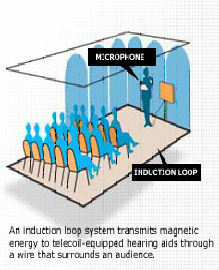 The loop system consists of a microphone to pick up the spoken word; an amplifier which processes the signal which is then sent through the final piece; the induction loop, a wire placed around the perimeter of a room or sanctuary to act as an antenna that radiates the magnetic signal to the hearing aid. When a hearing aid user selects the ‘T’ setting in the hearing aid or cochlear implant; he or she can pick up the sounds spoken into the PA system’s microphone directly into their hearing aid. Instead of hearing the sound transferred to the hearing via small changes in the sound pressure in the air, the sound reaches the user's telecoil via ripples in the magnetic field as long as the hearing device user is sitting in the looped area. The user hears the sound as if he or she is mere inches away from the microphone or the sound source. This results in greatly improved speech understanding because the listener receives a clear signal without any background noise. Even users with severe hearing loss rave about hearing loops - read testimonials here and a recent study about hearing loop benefits in the Hearing Review. 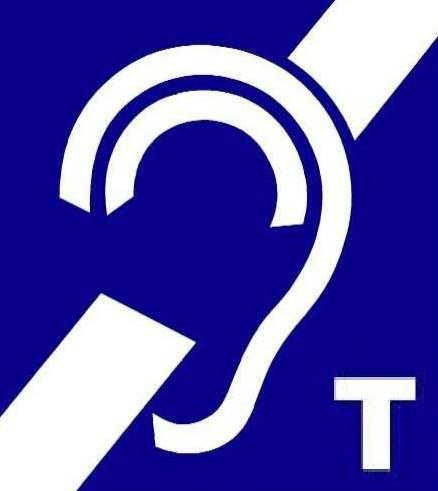 In Europe thousands of hearing loops are in use, including one at Westminster Abbey.